Walk a mile in my shoes; photo by Seite-3 on Flickr (noncommercial use permitted with attribution / no derivative works). Walking is the most basic and common mode of transportation, is recommended for a healthy lifestyle, and has numerous environmental benefits. 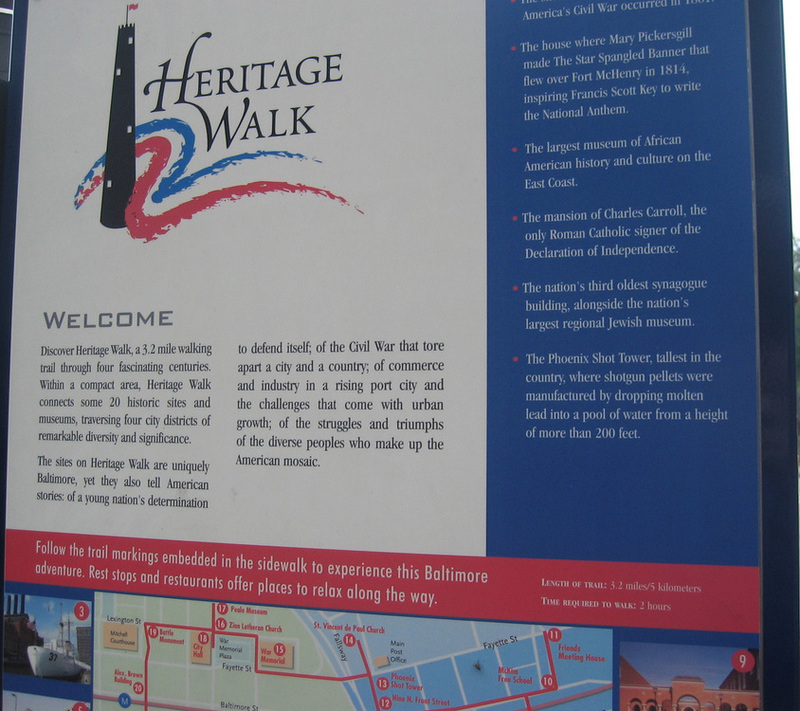 The city of Baltimore offers a fascinating historical walk named "Heritage Walk." 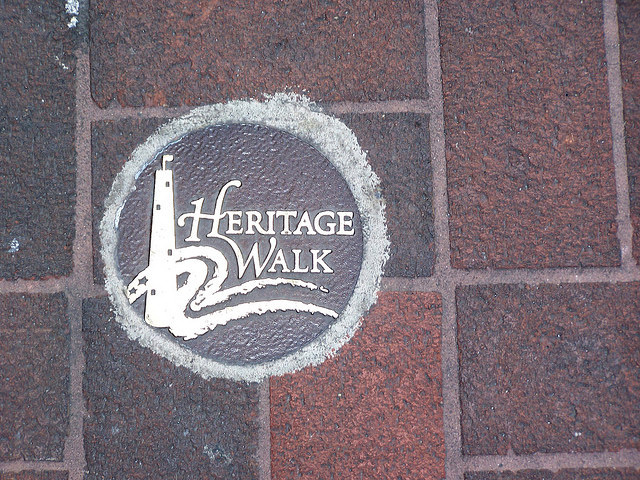 Heritage Walk is a 3.2 mile walking trail through four fascinating centuries. Within a compact area, Heritage Walk connects some 20 historic sites and museums, traversing four city districts of remarkable diversity and significance. The sites on Heritage Walk are uniquely Baltimore, yet they also tell American stories of a young nation’s determination to defend itself; of the Civil War that tore apart a city and a country; of commerce and industry in a rising port city and the challenges that come with urban growth; of the struggles and triumphs of the diverse peoples who make up the American mosaic. Trail markings are embedded in the sidewalk and rest stops and restaurants offer places to relax along the way. Length of trail: 3.2 miles / 5 kilometers; time required to walk: 2 hours. Baltimore Heritage Walk marker; photo by Chris on Flickr (noncommercial use permitted with attribution / share alike). Baltimore Heritage Walk; photo by banjaxx on Flickr (noncommercial use permitted with attribution / share alike).